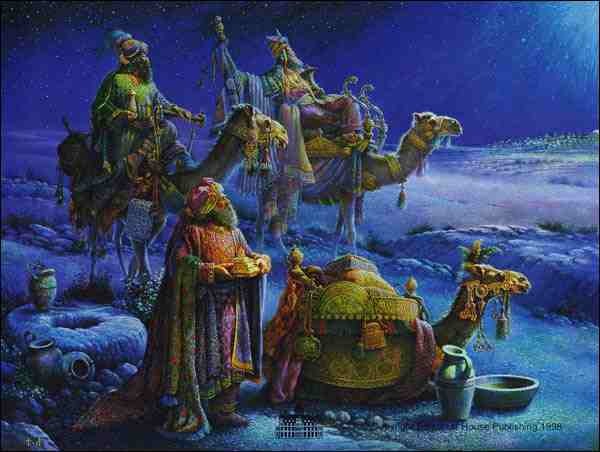 This art print, "And Wise Men Came Bearing Gifts" by Tom duBois is provided courtesy of Christ-Centered Art" ---New Window. "6 For unto us a Child is born, unto us a Son is given: and the government shall be upon His shoulder: and His Name shall be called Wonderful, Counsellor, The Mighty God, The Everlasting Father, The Prince Of Peace. 7 Of the increase of His government and peace there shall be no end, upon the throne of David, and upon his Kingdom, to order it, and to establish it with Judgment and with Justice from henceforth even for ever. The zeal of the LORD of hosts will perform this" (Isaiah 9:6-7). "1 In the beginning was the Word, and the Word was with God, and the Word was God... 3 All things were made by Him; and without Him was not any thing made that was made... 14 And the Word was made flesh, and dwelt among us, (and we beheld His glory, the glory as of the Only Begotten of the Father,) full of grace and truth" (John 1:1, 3, 14). "And without controversy great is the mystery of Godliness: God was manifest in the flesh, justified in the Spirit, seen of angels, preached unto the Gentiles, believed on in the world, received up into glory" (1Timothy 3:16). "And I will shake all nations, and the Desire Of All Nations shall come: and I will fill this house with glory, saith the LORD of Hosts" (Haggai 2:7). "I will declare the decree: the LORD hath said unto Me, Thou art My Son; this day have I begotten Thee" (Psalm 2:7). "And thou Bethlehem, in the land of Juda, art not the least among the princes of Juda: for out of thee shall come a Governor, that shall rule My people Israel" (Matthew 2:6). "30 And the angel said unto her, Fear not, Mary: for thou hast found favour with God. 31 And, behold, thou shalt conceive in thy womb, and bring forth a Son, and shalt call His Name JESUS. 32 He shall be great, and shall be called the Son of the Highest: and the LORD God shall give unto Him the throne of His father David" (Luke 1:30-32). "33 And He shall reign over the house of Jacob for ever; and of His Kingdom there shall be no end. 34 Then said Mary unto the angel, How shall this be, seeing I know not a man? 35 And the angel answered and said unto her, The Holy Ghost shall come upon thee, and the Power of the Highest shall overshadow thee: therefore also that Holy Thing which shall be born of thee shall be called the Son of God" (Luke 1:33-35). "But when the fulness of the time was come, God sent forth His Son, made of a woman, made under the Law" (Galatians 4:4). "7 But [Jesus] made Himself of no reputation, and took upon Him the form of a servant, and was made in the likeness of men: 8 And being found in fashion as a man, He humbled Himself, and became obedient unto death, even the death of The Cross" (Philippians 2:7-8). "Forasmuch then as the children are partakers of flesh and blood, He [Jesus] also Himself likewise took part of the same; that through death He might destroy him that had the power of death, that is, the devil" (Hebrews 2:14). "Hereby know ye the Spirit of God: Every spirit that confesseth that Jesus Christ is come in the flesh is of God" (1John 4:2). "16 For verily He took not on Him the nature of angels; but He took on Him the seed of Abraham. 17 Wherefore in all things it behoved Him to be made like unto His brethren, that He might be a merciful and faithful high priest in things pertaining to God, to make reconciliation for the sins of the people" (Hebrews 2:16-17). "1 And it came to pass in those days, that there went out a decree from Caesar Augustus, that all the world should be taxed... 4 And Joseph also went up from Galilee, out of the city of Nazareth, into Judaea, unto the city of David, which is called Bethlehem; (because he was of the house and lineage of David:) 5 To be taxed with Mary his espoused wife, being great with Child" (Luke 2:1, 4-5). "6 And so it was, that, while they were there, the days were accomplished that she should be delivered. 7 And she brought forth her firstborn Son, and wrapped Him in swaddling clothes, and laid Him in a manger; because there was no room for them in the inn" (Luke 2:6-7). "8 And there were in the same country shepherds abiding in the field, keeping watch over their flock by night... 10 And the angel said unto them, Fear not: for, behold, I bring you good tidings of great joy, which shall be to all people" (Luke 2:8,10). "And this shall be a sign unto you; Ye shall find the Babe wrapped in swaddling clothes, lying in a manger" (Luke 2:12). "15 And it came to pass, as the angels were gone away from them into Heaven, the shepherds said one to another, Let us now go even unto Bethlehem, and see this thing which is come to pass, which the LORD hath made known unto us. 16 And they came with haste, and found Mary, and Joseph, and the Babe lying in a manger" (Luke 2:15-16). "Hath not the Scripture said, That Christ cometh of the seed of David, and out of the town of Bethlehem, where David was?" (John 7:42). "And Jacob begat Joseph the husband of Mary, of whom was born Jesus, Who is called Christ" (Matthew 1:16). "22 And the Holy Ghost descended in a bodily shape like a dove upon Him, and a voice came from Heaven, Which said, Thou art My Beloved Son; in Thee I am well pleased. 23 And Jesus Himself began to be about thirty years of age, being (as was supposed) the son of Joseph, which was the son of Heli" (Luke 3:22-23). "Now the birth of Jesus Christ was on this wise: When as His mother Mary was espoused to Joseph, before they came together, she was found with Child of the Holy Ghost" (Matthew 1:18). "And knew her not till she had brought forth her firstborn Son: and he called His Name JESUS" (Matthew 1:25). "Where is He that is born King of the Jews? for we have seen His star in the east, and are come to worship Him" (Matthew 2:2). "Concerning His Son Jesus Christ our LORD, which was made of the seed of David according to the flesh" (Romans 1:3). "And again, when He bringeth in the Firstbegotten into the world, He saith, And let all the angels of God worship Him" (Hebrews 1:6).